Today the CJEU has provided rulings in more than 40 cases and new cases are regularly referred from national courts throughout the EU. Looking at the abundant case law, two main lines of discussion can be distinguished. One is concerned with the question of restrictive gambling policies and the consistency with EU internal market rules on free movement. The other concerns the CJEU looking into the way that licences and concessions are allocated. There is also gambling case law regarding the Notification Directive5 and regarding taxation but this will not be discussed in this chapter. Several Member States disputed the competence of the EU, arguing that gambling was not an economic activity within the ambit of the Treaty on the Functioning of the European Union (TFEU) and as a consequence did not fall under the free movement principles. The ruling of the CJEU was therefore extremely important in the development of the internal market issue on gambling. The CJEU considered gambling to be an ‘economic activity’ within the meaning of the TFEU that falls under the free movement of services of Article 56 of the TFEU. Nonetheless, it is an economic activity of a particular nature. Given the moral, religious and cultural aspects of lotteries, like other types of gambling, Member States can maintain restrictions to the free movement insofar as it is applied in a non-discriminatory and proportionate manner in order to protect consumers and public order. In Lindman, the CJEU found that Article 56 of the TFEU precludes a Member State from applying rules under which winnings from games of chance organised in other Member States are treated as income of the winner chargeable to income tax, whereas winnings from games of chance conducted in the Member State in question are not taxable.13 In this context, the CJEU investigated the appropriateness and proportionality of the Finnish restrictions and declined to accept the Finnish public interest related to public health as no evidence was submitted regarding the risks connected to playing games of chance, or on the existence of a particular causal relationship between such risks and the participation by Finnish nationals in lotteries organised in another Member State. The EFTA Court provided further guidance regarding the marketing of gaming services from abroad in this case. Taking into account the margin of discretion for the contracting parties, different levels of protection may exist throughout the European Economic Area (EEA). To the extent the national judge would find the exclusive rights system in place to be a lawful restriction, the host state has the right to prohibit the provision and marketing of games of chance from abroad, irrespective of whether these are lawful in their state of origin. Even if the restrictions are unlawful, the state can still require a licence in view of possible differences in the level of protection throughout the EEA. The EFTA Court thereby clearly dismissed the application of the principle of mutual recognition in the field of gambling. Even if the legislation and practice in the home state of the operators ensures a high level of protection in relation to the sociological features characterising that state, this may not necessarily amount to the same level of protection with respect to the features characterising the state where the services are to be provided. On 8 September 2009, the CJEU provided its landmark ruling in the Liga Portuguesa case that follows the line of the previous case law related to gambling services.19 The ruling was a victory for the EU Member States as the CJEU clearly recognised the Member States’ right to regulate and control their national online gambling markets, thereby also explicitly denying the application of the principle of mutual recognition in this field. With this ruling, the CJEU established the core principles of the discretionary power of the EU Member States in the field of online gambling. A key element in the reasoning of the CJEU is that games of chance accessible via the internet involve different and more substantial risks of fraud by operators against consumers compared to the traditional markets for such games. The CJEU thus found internet games to be more dangerous than physically offered games, even when regulated and controlled by the competent authorities of the Member State of residence of the consumer. Member States are therefore allowed to impose proportionate and necessary restrictions on the offer of online gambling services. In the Dutch Betfair20 and Ladbrokes21 cases of 3 June 2010, the CJEU confirmed the findings of Liga Portuguesa that there is no mutual recognition in the gambling sector. As mentioned, it expanded the scope of application of the theory of controlled expansion from being limited to public order concerns to also comprising the objective of general consumer protection related to gambling. Furthermore, the CJEU made it clear that passive provision of games of chance can be prohibited or restricted, meaning that the mere accessibility of online gambling products from a Member State can be sufficient to be regarded as providing services there. Member States are hence allowed to block all unauthorised websites of operators offering online gambling services accessible to its consumers. In the joined cases Sjöberg and Gerdin, the CJEU found the Swedish gaming legislation that prohibits advertising for gambling activities by private operators who aim to make profit, to be consistent with EU law. Member States can reserve the right to organise gambling services only to licensed operators who do not seek to make any profit. However, EU law does not allow a factual difference in the punishment for promotion of illegal gambling activities organised by a Swedish operator on the one hand, and the promotion of illegal gambling activities organised by operators of another Member State on the other.22 Sanctions for illegal domestic and illegal foreign operators can be covered under different formal legislation but the sanctions cannot be discriminatory as a consequence. On 8 September 2010, the CJEU issued its judgments in the Markus Stoss,23 Carmen Media24 and Winner Wetten25 cases. The Court questioned the state of the Germany monopoly and emphasised that a national court may consider a monopoly not suitable for guaranteeing achievement of the objective set if at the same time: (1) advertising measures emanating from the holder of such a monopoly and relating to other types of games of chance that it also offers are not limited to what is necessary in order to channel consumers towards the offer emanating from that holder, (2) other types of games of chance may be operated by private operators holding an authorisation, and (3) the competent authorities tolerate policies of expanding supply of other types of games of chance not covered by the said monopoly that, moreover, represent a higher risk of addiction than the games subject to that monopoly. This signified the end of the German monopoly on lotteries and sports betting as it existed at the time but the CJEU did not rule against the existence of a monopoly for games of chance as such. In general, the CJEU was of the opinion that a monopolistic approach is better than a competitive environment. However, a measure as restrictive as a monopoly must be accompanied by a legislative framework suitable for ensuring that the monopolistic operator will pursue the determined objective in a consistent and systematic manner. Since online gambling carries more risks in the area of consumer protection, a stricter approach is required and a prohibition measure covering any offer of games of chance via the internet may, in principle, be regarded as suitable for pursuing the legitimate objectives determined such as the protection of young persons, even though the offer of such games remains authorised through more traditional channels.27 The responsibility for an effective enforcement system and tackling illegal online gambling lies with the Member States. 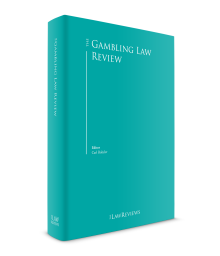 The CJEU thereby – indirectly – emphasises the need for a gambling regulator. Further guidance regarding state gambling monopolies was given by the CJEU in Zeturf, and Dickinger and Ömer. In Zeturf28 the CJEU confirmed the discretionary power of the Member States to decide to grant exclusive rights to a single body that is subject to strict control by the public authorities. However, operators holding exclusive rights over the organisation of horse races as well as over the betting on those races are in a very favourable position to increase betting activities, by organising more events on which bets can be placed. It is for the national court to determine whether the commercial policy pursued by the monopoly operator is part of a policy of controlled expansion. In Pfleger the CJEU reaffirmed its long-standing case law under which free, undistorted competition in the market of games of chance can have severely detrimental effects. Each Member State can assess whether, in the context of the legitimate aims it pursues, it is necessary to prohibit betting and gaming wholly or in part, or to lay down restrictions and supervisory rules that live up to the conditions in the CJEU’s jurisprudence.32 A global assessment by the national court of the circumstances in which restrictive legislation was adopted and implemented is therefore necessary. The CJEU reiterated that stand-alone fiscal objectives pursued by the Member State, without a consistent and protective regulatory framework, do not suffice to justify a limitation of free movement. Another important aspect highlighted in this case is that if a restrictive system is considered incompatible with EU law, it cannot give rise to penalties for an economic operator. In Placanica, the CJEU ruled on the issue of getting access to a licence through a tendering process. The Italian legislation at stake excluded all operators listed on the stock market from participating in a concession tender procedure for reasons of combating criminal involvement in gambling. According to the CJEU, sufficient alternative and less restrictive means were available to check the accounts and activities of such operators regarding the argument invoked that the shareholders of such companies were not always identifiable. This condition as such constituted an unjustifiable restriction of the free movement principles.42 It is not compliant with EU law to apply criminal sanctions against the concerned operator for not abiding by the administrative formalities linked to the concession system.43 In other words, if an operator did not have the possibility to acquire a licence, and this was because of a restriction that is not compliant with EU law, this operator cannot be sanctioned for offering gambling services without a licence. However, the obligation of transparency implies that competent authorities must ensure, for the benefit of any potential tenderer, a degree of publicity sufficient to enable the service concession to be opened up to competition and the impartiality of the award procedure to be reviewed.49 The CJEU thereby makes a distinction with the sole licensing system (see the Dutch Betfair case) in which the transparency principles do not call for a mandatory licensing procedure, if the exclusive right is granted to an operator under strict state control. In Costa and Cifone, the CJEU found the Italian rules establishing a state monopoly and a system of licences and authorisations to be discriminating where a minimum distance requirement for the establishment of new licence holders discriminates against operators excluded from the 1999 tendering procedure.50 Regarding the justification for the said discrimination, the CJEU recalls that grounds of economic nature (such as the objective of ensuring continuity, financial stability or a proper return on investment for operators) cannot be accepted as overriding reasons in the public interest to justify a restriction to the freedom provided by the TFEU. The objectives of reducing betting and gaming activities as well as the fight against criminality may justify restrictions on fundamental freedoms but this was not the case here. In Biasci and Rainone the CJEU confirmed that Member States are allowed to set out the obligation to be granted a concession and a police permit in order to open betting agencies in Italy.51 Nevertheless, a licensee is allowed to have certain activities on servers outside Italy provided that they are subject to control in Italy and that there is direct contact between the operator and the consumer. Over the past couple of years, the EU institutions have increased their involvement in shaping the gambling policy. The way EU secondary law developed or did not develop in this area has shown how sensitive this matter is for governments. Today, all three political EU institutions (the European Parliament, Council and Commission) actively take part in the political debate regarding gambling services. In the second half of 2008, the French presidency initiated the first formal discussions on gambling between the Member States in the Establishment and Services Working Group. This resulted in a constructive dialogue, reflecting on the very specific nature of gambling services that reflects differences between the Member States’ approaches.54 Under the Swedish presidency (second semester 2009), the formal discussions focused on the social cost of gambling and responsible gaming measures. The March 2009 European Parliament Resolution on the integrity of online gambling (also known as the ‘Schaldemose Report’)55 called for wide-ranging EU actions that would have a direct impact on the sector.56 The report addressed crucial issues such as transparency of the online gambling markets, the combating of fraud and crime, consumer protection, establishment of a code of conduct, and research, control and supervision. Member States are further advised to document the extent and growth of their online gambling markets. The report also urges the Commission to undertake an impact assessment of the effects of national regulation in relation to integrity, social responsibility, consumer protection and matters relating to taxation. The Belgian presidency (2010) focused on actual problems generated by cross-border gambling services, the role of the national (or regional) public authority and the sustainable contributions by lotteries to society. During the Competitiveness Council of 10 December 2010 the ‘Conclusions on the framework for gambling and betting in the EU Member States’ were adopted with unanimity. To ensure effective regulation of gambling services, the Council agreed that the Member States need to be given the responsibility to supervise the provision of gambling services in their territories through regulatory public authorities, established according to national legislation. These authorities may have various tasks. All EU Member States have different types of state lotteries or lotteries licensed by the competent state authorities. Contributions of lottery and related services play an important role for society, for example for the funding of good causes, directly or indirectly where applicable. This specific role needs to be recognised in discussions at the European level. The importance of the Council conclusions cannot be emphasised enough. Although they do not create a legally binding framework, they express the common political view shared by all EU Member States and oblige the Commission to deal with the issues directly. Two other reports were adopted by the European Parliament during 2011 and 2013.58 They did not fundamentally change the scope of the discussion. On 23 December 2012 the Commission adopted the Communication ‘Towards a comprehensive European framework for online gambling’. Among the priorities, as outlined, were the adoption of the consumer protection recommendation, the Fourth Anti-Money Laundering Directive (the AML Directive), the infringement cases, the match-fixing problems and the standardisation of gambling equipment. The last point has been replaced by a request for standardisation on reporting. While numerous infringement cases seem to be processed, none of them went up to the CJEU until now. We therefore believe that it is premature to comment on these procedures. The question of match-fixing has currently been addressed by the Macolin convention of the Council of Europe, but no further EU measures have been taken. Two last issues are of importance: the AML Directive and the European Commission recommendation. The final text of the future AML Directive was adopted on 20 May 2015. The Directive will apply to all offline and online gambling service providers, while the Third AML Directive only addressed casinos. However, with the exception of casinos, and following an appropriate risk assessment, Member States may decide to exempt, in full or in part, providers of certain gambling services from national provisions transposing this Directive on the basis of the proven low risk posed by the nature and, where appropriate, the scale of operations of such services. Finally, there is the recently adopted European Commission Recommendation on principles for the protection of consumers and players of online gambling services and for the prevention of minors from gambling online.59 In principle, a recommendation is a non-binding legal instrument available under the TFEU. This Commission initiative is highly contentious with certain Member States. According to Belgium, the European Commission exceeded its competence by adopting a recommendation without precise legal basis and in disrespect of the institutional balance.60 Belgium therefore initiated an annulment procedure against the recommendation at the General Court. The General Court declared the case inadmissible. An appeal is pending before the CJEU. 1 Philippe Vlaemminck is a partner, Robbe Verbeke is a senior associate, Beata Guzik is a director and Justine Van den Bon is a junior associate at Pharumlegal. 2 Some cases of the EFTA Court are also mentioned given their specific relevance. 3 Point 3 of Annex 2 to Part A of the Conclusions of the Presidency – European Council in Edinburgh 11–12 December, 1992. 4 Among the directives excluding gambling we find the following: the Directive on Electronic Commerce 2000/31/EC, the Services Directive and the Audio-visual Media Services Directive. 5 Directive 2015/1535/EU of the European Parliament and of the Council of 9 September 2015 laying down a procedure for the provision of information in the field of technical regulations and of rules on Information Society services, OJ L 241/1, 17 September 2015. 6 Judgment of the CJEU of 24 March 1994, Schindler, C-275/92, EU:C:1994:119. 7 Judgment of the CJEU of 21 September 1999 Läärä, C-124/97, EU:C:1999:435, paragraph 33. 9 Judgment of the CJEU of 11 September 2003 Anomar e.a., C-6/01, EU:C:2003:446. 10 Judgment of the CJEU of 21 October 1999 Zenatti, C-67/98, EU:C:1999:514. 11 Ibid., paragraph 36. The CJEU previously observed in paragraph 60 of Schindler, even if it is not irrelevant that lotteries and other types of gambling may contribute significantly to the financing of benevolent or public-interest activities, that motive cannot in itself be regarded as an objective justification for restrictions on the freedom to provide services. 12 Judgment of the CJEU of 6 November 2003 Gambelli, C-243/01, EU:C:2003:597, paragraphs 67 and 69. The CJEU repeated this in its judgment of of 11 June 2015 Berlington Hungary e.a., C-98/14, EU:C:2015:386, paragraph 61. 13 Judgment of the CJEU of 13 November 2003 Lindman, C-42/02, EU:C:2003:613, paragraph 21. 14 Judgment of the CJEU of 6 March 2007 Placanica, C-338/04, C-359/04 and C-360/04, EU:C:2007:133, paragraph 55. 15 EFTA judgment of 30 May 2007, case E-3/06, Ladbrokes v. Norway, available at www.eftacourt.int/uploads/tx_nvcases/3_06_Judgment_EN.pdf, paragraph 87. In this case, the EFTA Court was asked to formulate an advisory opinion on the Norwegian sport betting market. An advisory opinion of the EFTA Court is comparable to a preliminary ruling of the CJEU, except that an advisory opinion is not binding upon the national court that referred the question concerned to the EFTA Court. 16 Judgment of the CJEU of 3 June 2010 Sporting Exchange (Betfair), C-203/08, EU:C:2010:307; judgment of the CJEU of 3 June 2010 Ladbrokes, C-258/08, EU:C:2010:308. 17 EFTA Court judgment of 14 March 2007, E-1/06, ESA v. Norway, available at www.eftacourt.int/uploads/tx_nvcases/1_06_Judgment_EN.pdf, paragraph 51. 18 The European Economic Area Agreement applies to Norway, Iceland and Liechtenstein and the free movement rules laid down in the agreement are comparable to the principles of the TFEU. 19 Judgment of the CJEU of 8 September 2009 Liga Portuguesa de Futebol Profissional, C-42/07, EU:C:2009:519. 20 Judgment of the CJEU of 3 June 2010 Sporting Exchange (Betfair), C-203/08, EU:C:2010:307. 21 Judgment of the CJEU of 3 June 2010 Ladbrokes, C-258/08, EU:C:2010:308. 22 Judgment of the CJEU of 8 July 2010 Sjöberg and Gerdin, C-447/08 and C-448/08, EU:C:2010:415, paragraphs 56 and 57. 23 Judgment of the CJEU of 8 September 2010 Markus Stoss and others, joined cases C-316/07, C-358/07, C-359/07, C-360/07, C-409/07 and C-410/07, EU:C:2010:504. 24 Judgment of the CJEU of 8 September 2010 Carmen Media, C-46/08, EU:C:2010:505. 25 Judgment of the CJEU of 8 September 2010 Winner Wetten, C-409/06, EU:C:2010:503. 26 Markus Stoss and others, C-316/07, C-358/07 to C-360/07, C-409/07 and C-410/07, paragraph 103. 27 Carmen Media, C-46/08, paragraph 105. 28 Judgment of the CJEU of 30 June 2011 Zeturf, C-212/08, EU:C:2011:437, paragraph 57. 29 Ibid., paragraphs 72 and 75. 30 Judgment of the CJEU of 15 September 2011 Dickinger and Ömer, C-347/09, EU:C:2011:582. 31 Judgment of the CJEU of 24 January 2013 Stanleybet and Others, C-186/11, EU:C:2013:33, paragraph 46. 32 Judgment of the CJEU of 30 April 2014 Pfleger e.a., C-390/12, EU:C:2014:281, paragraph 45. 33 Judgment of the CJEU of 12 June 2014 Digibet and Albers, C-156/13, EU:C:2014:1756, paragraph 36. 34 Judgment of the CJEU of 22 January 2015 Stanley International Betting, C-463/13, EU:C:2015:25, paragraph 54. 35 Judgment of the CJEU of 30 June 2016 Admiral Casinos, C-464/15, EU:C:2016:500, paragraphs 34 and 36. 36 Dickinger and Ömer, C-347/09, paragraph 77. 37 Judgment of the CJEU of 8 September 2016 Politanò, C-225/15, EU:C:2016:645, paragraph 46. 38 Opinion of Advocate General Szpunar of 19 January 2017 in case C-591/15 The Gibraltar Betting and Gaming Association Limited and the Queen, EU:C:2017:32. 39 Opinion of Advocate General Sharpston of 9 March 2017 in case C-685/15 Online Games, EU:C:2017:201, paragraph 53. 40 Request for a preliminary ruling from the Consiglio di Stato (Italy) lodged on 7 June 2016 – Global Starnet Ltd v. Ministero dell’Economia e delle Finanze, Amministrazione Autonoma Monopoli di Stato (C-322/16), OJ C 343/24, 19 September 2016. 41 Request for a preliminary ruling from the Fővárosi Közigazgatási és Munkaügyi Bíróság (Hungary) lodged on 3 January 2017 – Sporting Odds Limited v. Nemzeti Adó- és Vámhivatal Központi Irányítása (C-3/17), OJ C 112/16, 10 April 2017. 42 Placanica, joined cases C-338/04, C-359/04 and C-360/04, EU:C:2007:133, paragraph 62. 44 Judgment of the CJEU of 13 September 2007 Commission v Italy, C-260/04, EU:C:2007:508, paragraph 34. 45 Judgment of the CJEU of 31 January 2008 Centro Europa 7, C-380/05, EU:C:2008:59, paragraph 100. 46 Sporting Exchange (Betfair), C-203/08, paragraph 59. 47 Markus Stoss and Others, joined cases C-316/07, C-358/07 to C-360/07, C-409/07 and C-410/07, paragraph 81. 48 Judgment of the CJEU of 9 September 2010 Engelmann, C-64/08, EU:C:2010:506, paragraphs 45 and 48. 50 Judgment of the CJEU of 16 February 2012 Costa and Cifone, C-72/10 and C-77/10, EU:C:2012:80. 51 Judgment of the CJEU of 12 September 2013 Biasci and Rainone, C-660/11, EU:C:2013:550, paragraph 27. 52 Winner Wetten, C-409/06, paragraph 69. 53 Judgment of the CJEU of 4 February 2016 Ince, C-336/14, EU:C:2016:72, paragraph 54. 54 See progress report of the French presidency of the EU, ‘Gambling and betting: legal framework and policies in the Member States of the EU’, dated 27 November 2008, 16022/08. 55 C Schaldemose, ‘Committee on the Internal Market and Consumer Protection’, Report on the Integrity of Online Gambling, (17 February 2008), 2008/2215(INI). 56 European Parliament Resolution of 10 March 2009 on the integrity of online gambling (2008/2215(INI)). 57 See progress report of the Spanish presidency of the EU, ‘Legal framework for gambling and betting in the Member States of the European Union’, dated 11 May 2010, 9495/10. 58 European Parliament Resolution on online gambling in the internal market (10 September 2013), European Parliament resolution on online gambling in the internal market (15 November 2011). 59 Commission Recommendation of 14 July 2014 on principles for the protection of consumers and players of online gambling services and for the prevention of minors from gambling online, OJ L 214/38, 19 July 2014. 60 Order of the General Court of 27 October 2015 Commission v. Belgium, T-721/14, EU:T:2015:829. Appeal against this decision was brought before the CJEU, known as case C-16/16 P. An oral hearing will take place on 2 June 2017. Thirty years ago, employment law was almost entirely a national subject. During the past 15 years or so, that position has changed as business has become increasingly international. As this process developed, employers structured themselves internationally, so that legal and HR teams, among others, are able to deal with a globally mobile workforce. Employment law is a fast-moving area with significant developments occurring every year in all the jurisdictions covered by this book – employment law does not stand still.